A noble white-and-gold restaurant stands on El Camino Real in front of Santa Clara University – Fiorillo’s, a family-owned and operated eatery built in 1972. The restaurant has become a tradition for a number of Santa Clara students; one of my friends takes his family there every time they come into town. And there is good reason why: Eating at Fiorillo’s makes you feel at home. While Fiorillo’s serves focaccia and whole wheat bread for starters, I heavily recommend ordering a loaf of their garlic bread ($3.95). The bread falls on the chewy side, and though it contains a lot of herbs to make the taste more complex, it retains a perfect level of garlic flavor. Cheese is also available for an extra dollar. The bruschetta ($8.95), piled high with juicy tomatoes, peppers, and spices, is also a good choice for sharing with friends. There are a lot of options for entrees, with portion sizes large enough that you can eat half and take the other half home. The lasagna ($12.95) is a personal favorite of mine – a classic dish done well, with tender meat, sweet cheese, and tangy marinara sauce. Fiorillos also boasts a mix-and-match pasta menu, ranging from noodles to ravioli, as well as a pizza and sandwich menu. 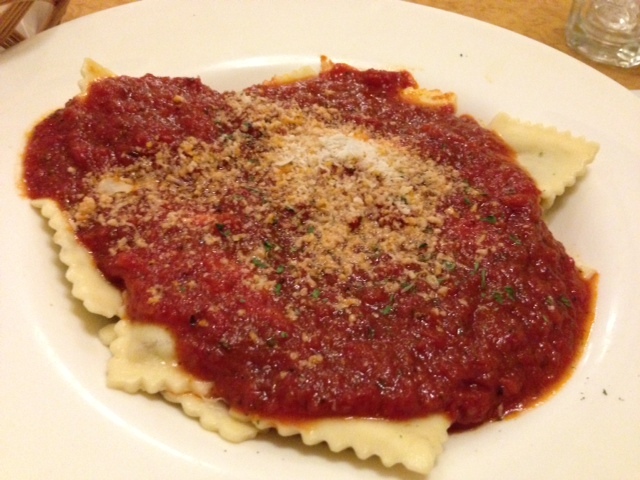 The meat ravioli (pricing depends on selection) is tender and spicy, and the sauce is great for dipping bread. The dessert menu is not without its options. The cheesecake ($8) has that smooth, fall-away texture that marks it as a masterpiece, and the tiramisu ($7) combines a creamy upper layer with a intensely flavored lower layer, the way tiramisu should be made. With its warm atmosphere, well-stocked bar, and some of the friendliest wait staff I’ve ever encountered, eating at Fiorillo’s is truly a comfort. Even if you’re having a bad day, it’s guaranteed that you will leave with a full stomach and a smile on your face.